*small for gestational age birth was restricted to live singleton and twin births. Source: CICH graphic created using data adapted from the Discharge Abstract Database, Canadian Institute for Health Information; and, Fichier des hospitalizations MED-ECHO, ministere de la Santa et des Services sociaux du Québec. https://secure.cihi.ca/free_products/AIB_InDueTime_WhyMaternalAgeMatters_E.pdf – accessed June 20, 2017. The rate of preterm birth increased with maternal age from 2006 to 2009. 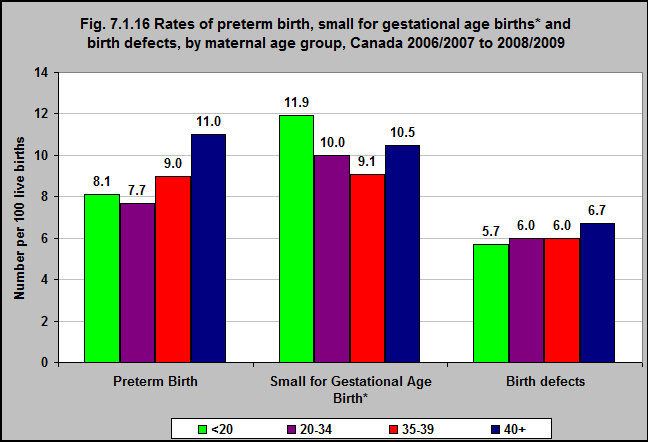 In Canada, from 2006 to 2009, the rate of small for gestational age birth decreased for mothers < 20 years old through 35 to 39 years; and then increased for mothers 40+. The rate of birth defects increased with increasing maternal age.